In scikit-learn RadiusNeighborsClassifier is very similar to KNeighborsClassifier with the exception of two parameters. 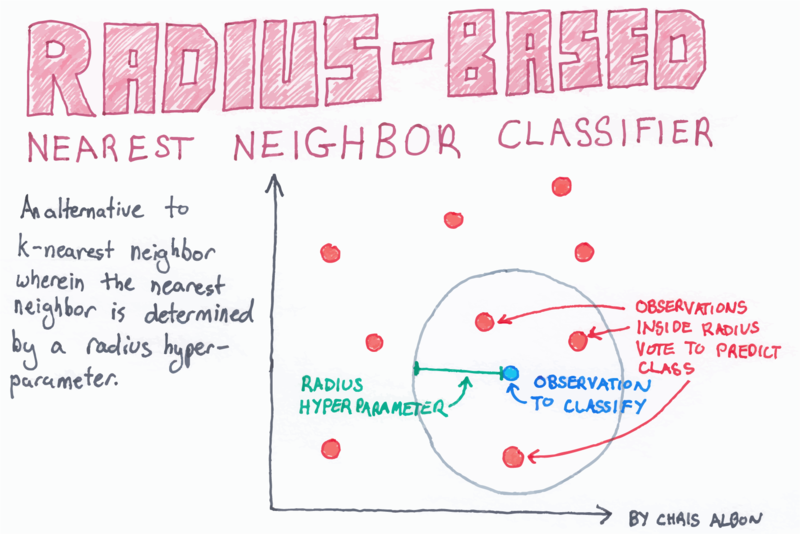 First, in RadiusNeighborsClassifier we need to specify the radius of the fixed area used to determine if an observation is a neighbor using radius. Unless there is some substantive reason for setting radius to some value, it is best to treat it like any other hyperparameter and tune it during model selection. The second useful parameter is outlier_label, which indicates what label to give an observation that has no observations within the radius - which itself can often be a useful tool for identifying outliers.